Looking for trees that provide privacy from the wrong kind of neighborhood watch? 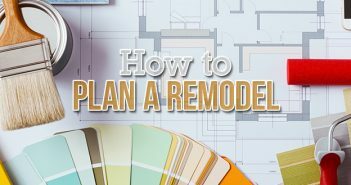 But when it comes to finding the best trees for privacy, there are a lot of options – and factors – to keep in mind. “While traditional fences can be installed almost anywhere, a ‘green fence’ needs sunlight and water to thrive,” says Missy Henriksen of the National Association of Landscape Professionals. In order to find the best trees for screening neighbors, noise and the elements from your own yard, it’s important to understand what you’re getting into before planting. Our rundown of some of the most popular choices will help you find the best trees for privacy in your own backyard. For a large, rugged privacy tree that provides full coverage, the Eastern Redcedar is the conifer for you. “Evergreen plants like broadleafs or conifers are generally a good choice for year-round effectiveness,” according to Henriksen, making this durable juniper a great privacy tree option. Its red, aromatic wood and thick foliage will give your backyard an earthy fragrance and make it a magnet for local birds and other wildlife. Planting Guidelines: Eastern Redcedars can reach 60 feet high and 20 feet wide at maturity, so they’re best suited for larger backyards. If you have the space, make sure to plant these about 20 feet apart and away from power lines or neighboring homes. Looking for fast-growing privacy fence trees? The Hybrid Willow will have you covered, quickly. With a growth rate of 6 to 12 feet per year, this disease-resistant plant typically reaches its mature height in just five years. They grow well even in cold environments and their dense foliage makes them great windbreak trees. They’re also great for drying out swampy soil. 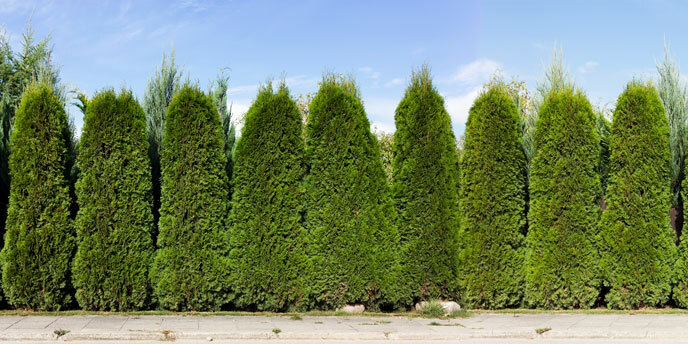 One of the most popular trees for privacy, the Leyland Cypress is a beautiful, fast-growing evergreen that is great for solid, full coverage in large backyards. They have been known to reach heights of 50 feet in just 15 years. When planted in a row, they create an impenetrable mass of branches that make them great trees for screening wind, snow and even noise. If your yard can’t accommodate some of the larger privacy fence trees, the Spartan Juniper is a great option for mid-sized backyards. Planted in a row, Spartan Junipers provide a stately, uniform look to any backyard, and their compact foliage makes them effective windbreak trees. Looking for trees that provide privacy while taking up very little space? The Sky Pencil Holly is the right plant for you. 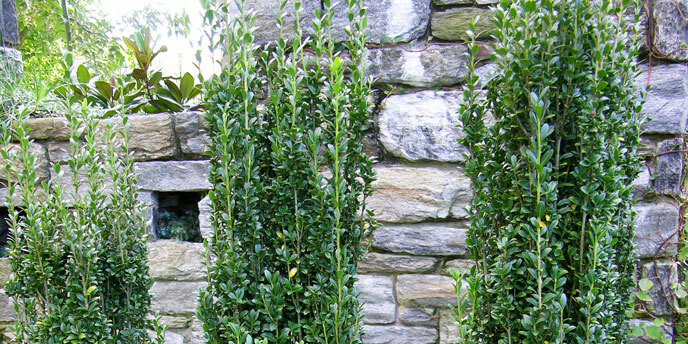 With a mature height between 8 to 10 feet tall and a width of just 2 feet, Sky Pencil Hollies act as the ultimate space-saving privacy fence trees while still providing solid protection from wind, noise and wandering eyes alike. Working on a backyard makeover? Learn how to get rid of dirt and yard waste from your landscaping project quickly and affordably. 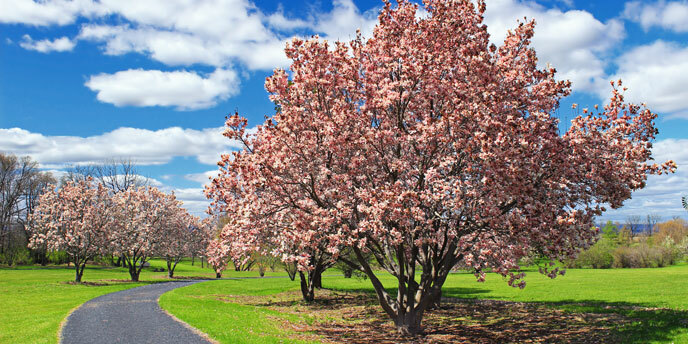 Their uniform, cone-like shape and consistent annual growth rate of 3 to 5 feet make for a polished tree privacy fence that requires very little pruning to maintain. You can trim the tops regularly for a classic, French Renaissance feel or leave them be for a more natural look. 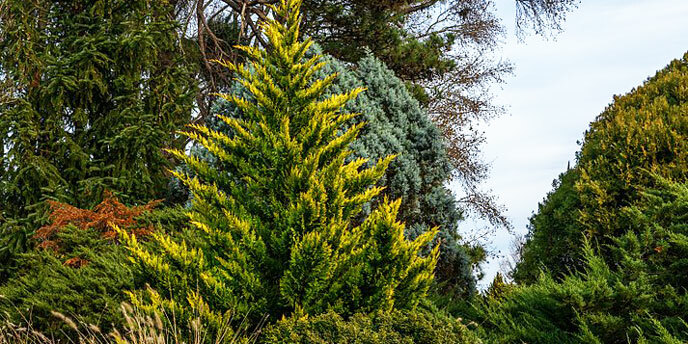 Planting Guidelines: If you like the height and density of the Leyland Cypress but don’t have the conditions to maintain it, the Green Giant is a great alternative. Just be sure to have a defense against deer on hand, as their soft leaves and branches are irresistible to these native grazers. With a mature height of just 12 to 14 feet, the Emerald Green Thuja offers all the classic beauty of its giant cousin at half the size. Their controlled growth rate of just 6 to 9 inches per year makes them a great choice for landscaping areas that are pressed for space. Planting Guidelines: These beauties are a great choice for mid-sized yards, and their slender shape makes them ideal as foundation plants along the home – just be sure to give them enough room to grow vertically. When planting these trees for privacy or wind blockage, it’s best to space them about 2 feet apart for optimal coverage. Flowering Dogwoods are good privacy trees for those looking for seasonal coverage with a pop of color. Dogwoods come in a variety of colors including white, pink and red, and their ornamental berries will make your backyard popular with local robins, cardinals and blue jays. Planting Guidelines: Dogwoods prefer well-drained soil that is not too dry and do best in large to mid-sized backyards. Their beautiful, compact blooms are great for vertically extending an existing privacy fence when planted 20 feet apart. 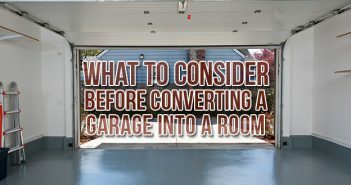 They can also be strategically placed for spot coverage – for instance, blocking your neighbor’s favorite view of your lawn chairs. These fast-growing, woody evergreens are a popular privacy tree choice in places like Florida and California. Weeping Podocarpus trees have plush, billowing foliage and work well as spot privacy trees or in a full privacy tree fence. Planting Guidelines: This plant’s drought tolerance, preference for dry soil and ability to thrive in mildly salty conditions make it an ideal choice for southern and coastal areas. These plants will do best on large properties and should be planted 10-15 feet away from homes and other buildings. When planting in a row, allow about 5-10 feet of space between each tree. For privacy fence trees that are as beautiful as they are functional, try lining your yard with Goldspire Ginkgo. These unique trees take on a narrow, pyramidal shape with their deep green summertime leaves giving way to stunning golden hues each fall. 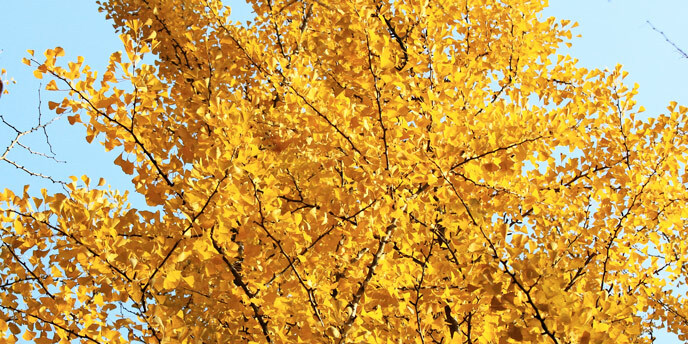 Planting Guidelines: The Goldspire Ginkgo is a durable, smog-resistant tree that will do well in mid-sized backyards. It thrives in a wide variety of climates and requires little maintenance. Just be careful not to confuse it for its cousin, the Ginkgo. Ginkgo trees can reach sizes of 40 to 60 feet, and their berries smell awful. Goldspire Ginkgos are specifically bred for their smaller, slender shapes and lack the pungent fruit of their cousins. “When selecting plants for a fence, it’s important to take into consideration the specific region of the country where you live,” says Henriksen. So, if you’re ever unsure about a tree’s fit, just ask a nearby landscape expert. They have extensive knowledge of trees that provide privacy and that will also thrive in your local climate. Take measurements and have a few pictures of your backyard on hand so they have some idea of the space you’re working with; you’ll be on your way to a great, natural privacy screen in no time. And always remember: good tree fences make good neighbors. 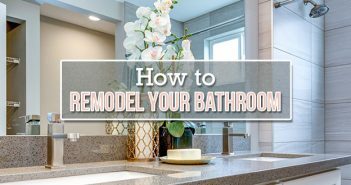 Have a few tips of your own? Share them in the comments below! It would have been great to include which zones or climates each tree prefers. 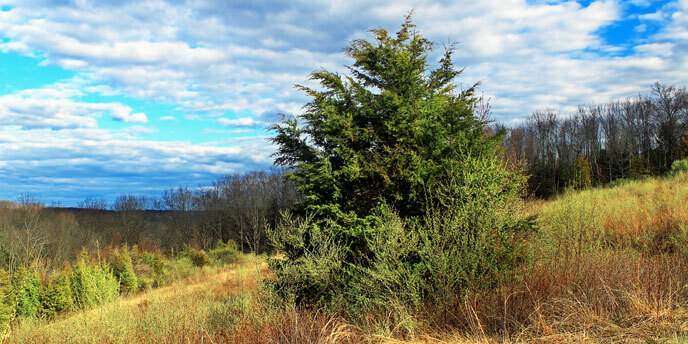 Leyland cypress is subject to canker diseases here in the SE United States, so it may not be a preferred choice there. Older, larger Lwyland trees exhibit severe limb dieback. Podocarpus is a native of Africa, and we have too many native plants to introduce another exotic here in the US. If you plant a ginkgo, you’re right; the berries smell awful, as do the flowers to me. Keeping in mind that it, too, is an exotic, if you choose to plant these, be sure to get a male tree. They don’t stink. Your hybrid willow is also a cross (hence the word “hybrid” with an exotic species, and therefore could develop into an exotic problem if they produce voluminous seed. The other choices seem to be the best choice of the 10. We love all of these trees! We grow quite a few of these varieties at our nursery here in North Florida and can ship across the US. Great choices! Hi Charlie, thanks for commenting! You are correct, the Leyland Cypress can reach upwards of 70 feet when planted alone; we previously only listed its average height and width when planted in rows. We’ve updated the article to include this information. will eastern white cedar grow in full shade? Because the Eastern White Cedar is a type of Arborvitae, it has similar sunlight needs to that of the Green Giant Thuja. Typically, these trees grow better in full to partial sunlight. However, you may want to chat with a local arborist or landscape expert before planting. Thanks for commenting!